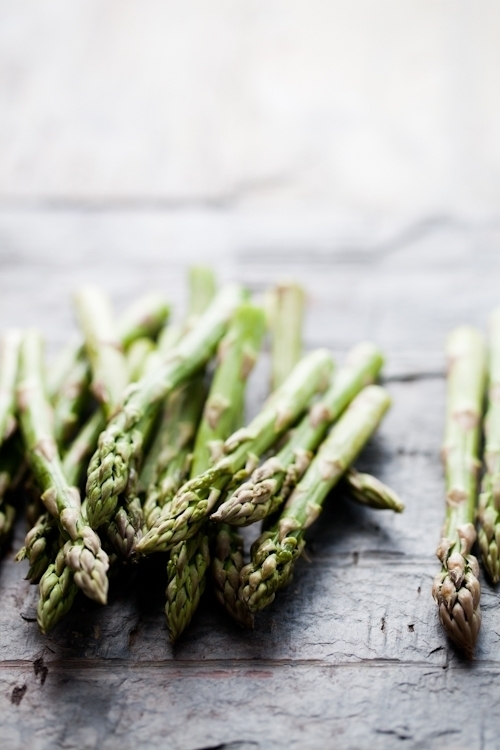 Growing up, many a family dinners were spent around a big plate of freshly blanched asparagus during Spring. When I saw the first asparagus at Boone Hall Farms, I could not resist. We're eating lots of them! In salads with a lemon honey vinaigrette. In soups with a dab of creme fraiche. Charred with a sprinkle of sea salt and oregano. The farm also had the first strawberries of the season which is a good thing because I suspect a rabbit is eating the wild strawberries I planted last year. I love Spring. Everything and everyone takes on a new attitude. It's a rebirth. Since submitting the final book files to the printers last Monday, I have been experiencing my own rebirth so to speak. In a little over 5 weeks, four months of hard work will be coming together in a lovely binded package. So surreal. I gave it, I gave you my all. I have worked with the most wonderful team of editors and designers. So many emotions. Elated, calm, sleepy. I gave myself an entire day of doing stuff. Walking downtown with the dogs, taking B. out for dinner. Just stuff. Then it was back to shoots and new clients. Normalcy in craziness suits me fine it seems. Just as Heidi very mentioned in a post, after the work day is over, I crave repetition to keep me grounded. By the way, her new cookbook is stunning! I can't wait to start cooking from it! Simple things. On repeat. Favorite songs. Baking cookies. Eating asparagus and grilling fish almost daily. Simple things are essential to my inner peace. Living on the water, going to the dock to check on our crab traps or to the marina to get freshly caught fish is one of my little pleasures. When the fish guy showed up with freshly caught red snapper, you can bet I put a couple in my basket! Our evening ritual now that the days are longer and the temperatures appropriate for shorts and t-shirts is to sit on the back deck with a cold drink while we grill and make small plates of salads, grilled bread with tomatoes and garlic, crunchy carrots and aioli. 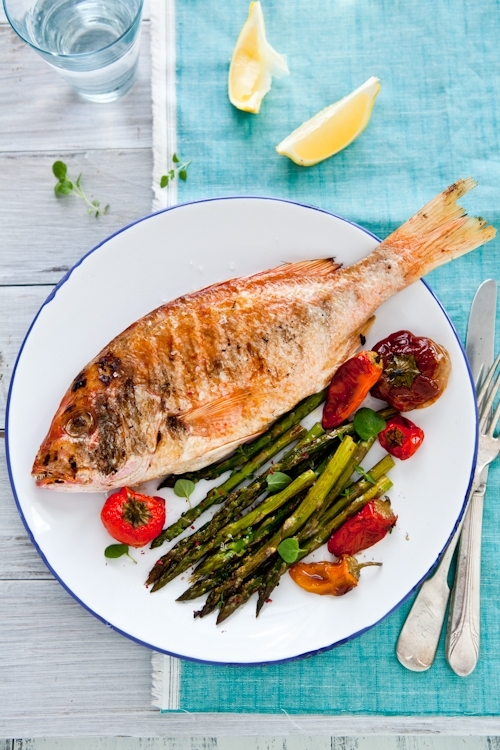 Grilled snapper with oregano served with roasted baby mixed peppers and asparagus. This is a typical dinner for us. Nothing grand but everything fresh and accompanied by simple preparations. If only around dinner time, we can enjoy time slow down a bit. 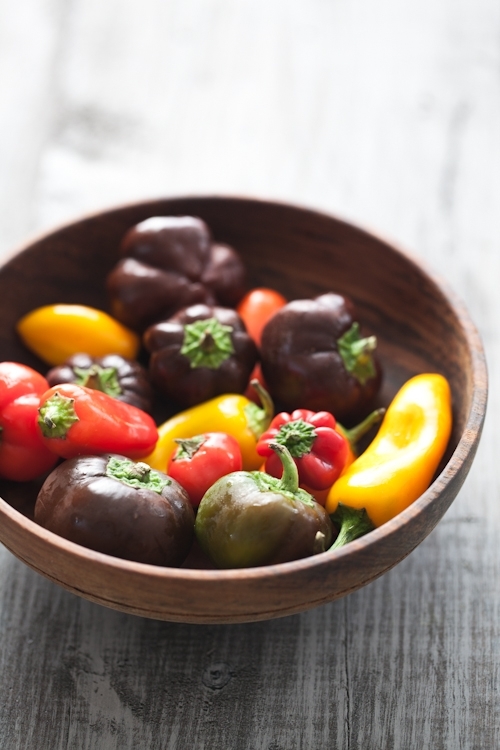 I certainly hope you will be able to crank the grill soon and enjoy simple and fresh flavors such as these. Ah! I keep forgetting an important update: the book title has changed from "Foodography" to "Plate To Pixel. Digital Food Photography and Styling" the cover has been redesigned a little (see here) but it's taking some time for booksellers to update their data base. The book will be available online worldwide through your country's amazon page around late April and on bookstores shelves early May. Yep. It's coming up soon! Preheat the grill to medium high. 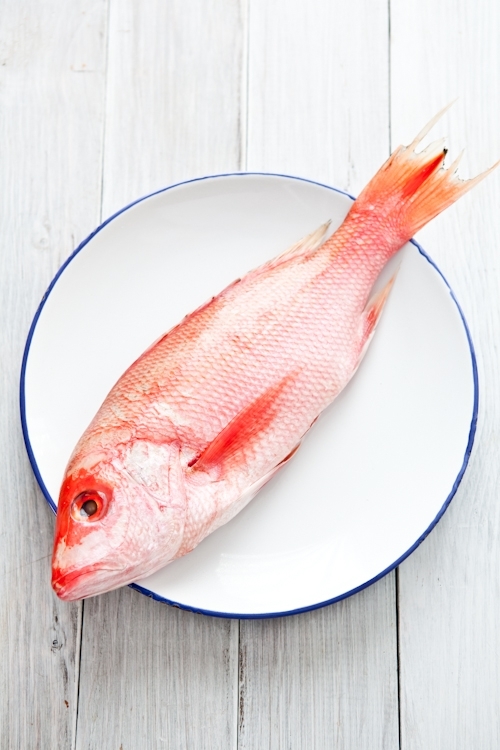 Brush the red snappers with olive oil and sprinkle them with the oregano and salt and pepper to taste. Place on the grill racks and cook 4-5 minutes on each side. In the meantime, preheat the oven to 375F (you can prepare the veggies on the grill too). Wash the asparagus. Break the bottom stems off and discard. Toss the asparagus spears and peppers in some olive oil, then place them on a parchment paper or Silpat lined baking sheet. Season with salt and pepper. Roast the vegetables for 12-14 minutes, or until tender and cooked through. All week I have been wanting to come here and post, chat and just have a bit of normalcy. All week nothing felt normal. Things that were big to me meant nothing once the television was turned on. Natural tragedies, political and social changes. The words I was dissecting were just that. Words. Yes, posting seemed trivial. Yes, meeting clients and working on shoots felt awkward. At the same time, it was what I had to do. What I must do in order to help others. When thousands of people In Japan could use a lending hand, now is not the time to sit and be idle. Now is the time to work, work more and as much, often, ... so that one can participate in the rebuilding efforts through donations, raffles, organized to help people who right now face the most gutt wrenching uncertainties of their lives. Yes, I can do my part. I have given and I will again when asked. So can you. We all can. We can show our humanities. Aside from various events I am participating in, I also would like to do extend the way I contribute by involving you guys. For each of my prints purchased through my etsy shop, I will donate $20 of its amount to the Red Cross for Japan. My goal is to raise at least $1000. That's 50 prints. We can do this! You'll help a great organization and receive a professionally printed picture for your home. If you want to help me, head over here: Tartelette on etsy. Like most of you, every daily activity, every bit of work done this past week was tinted with a strong feeling of compassion and heartache for everyone out there in the world facing hardship. The one way I found to honor the memory of the missing was to keep up with that daily routine and once again count my blessings and hug my loved ones a little stronger while saying good morning. It meant paying close attention to keeping a positive attitude and quiet inner peace while at work on difficult projects. It also made me react the same way I do when things are off kilter with the world, I gather friends and family for dinner. I do what I know to do well. Sitting everyone down around a good meal and listen to their story. Letting people unload around a sweet little nosh and a glass of wine is one of the best therapies I know. It's been a busy week but I still wanted to come up with something refreshing that would pair well with the gorgeous weather and warm weather we are having here. It is Spring after all. 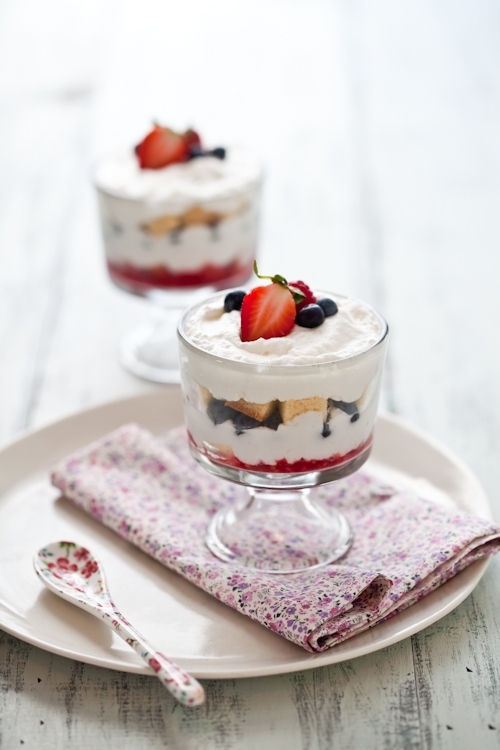 It does get from warm to hot in days however, which is quite perfect timing for something as light and airy as a Mixed Berry Trifle. 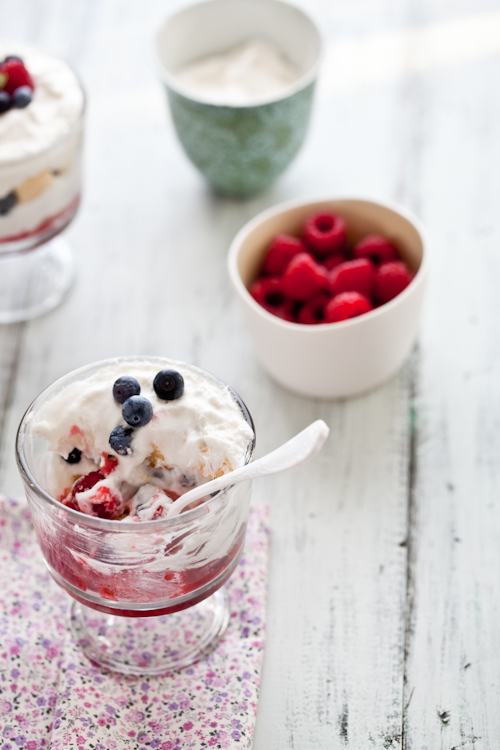 Layers of homemade almond lemon cake, clouds of fresh whipped cream, and the mild tang of raspberries and blueberries. No one seemed to have issues making their spoons cling all the way to the bottom in appreciation. Appreciate the little things in life. Something I am quite fond of. 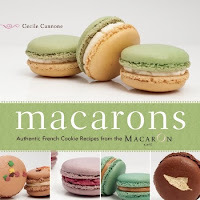 One more thing before the recipe: the winner of "Macarons: Authentic French Cookie Recipes from the Macaron Cafe" by Cecile Cannone is...Janelle from Leemaemarie. Email me your snail mail info at mytartelette at gmail dot come and I'll get the book off to you! Makes enough for 4 to 6 and you'll have some leftover cake which is great toasted for breakfast! Preheat the oven to 325F/160C. Line a 8 to 9-inch round cake pan with a piece of parchment paper and lightly grease with some melted butter or cooking spray. Reserve. Toast the almonds on a separate baking sheet until pale golden, about 7 minutes. Cool completely and pulse the almonds with 2.5 tablespoons sugar until finely ground. Stop before the nuts start to form a paste. 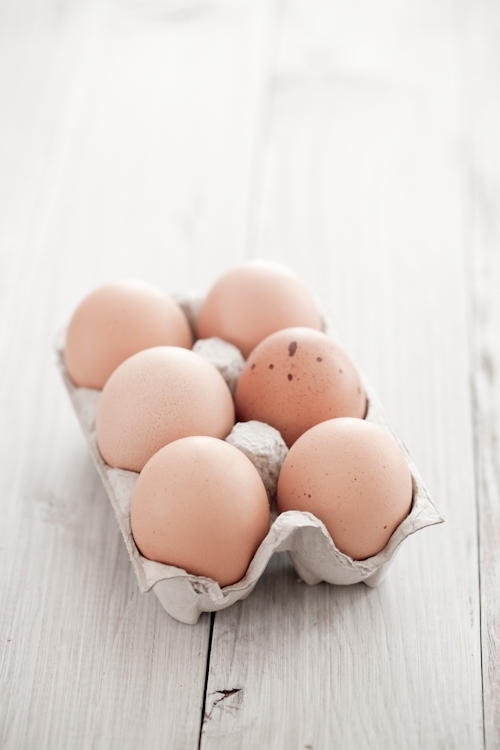 Place the eggs into a 2-cup measure with a spout and whisk them just to break them up. In a stand mixer fitter with the whisk attachment, beat the egg whites on medium low speed until foamy. Increase the speed and whisk until soft peaks. Gradually beat in the remaining cup of sugar. Continue beating until the meringue is thick and glossy. With the beater off, stir in the almond mixture until evenly incorporated. Re-attach the whisk and with the mixer on medium speed, add the beaten eggs to the meringue, 2 tablespoons at a time, beating for 2 minutes after each addition. It should take a total of 20-25 minutes but be sure to beat for a minimum of 20 minutes. Add the lemon zest. Sprinkle the flour over the batter and fold until completely incorporated. Pour the batter onto the prepared baking sheet and bake for 15-20 minutes until a knife inserted near the center comes out clean. Remove from the oven and immediately poke holes in the cake with a fork. Pour the lemon juice over the holes and let the cake cool completely before using it. 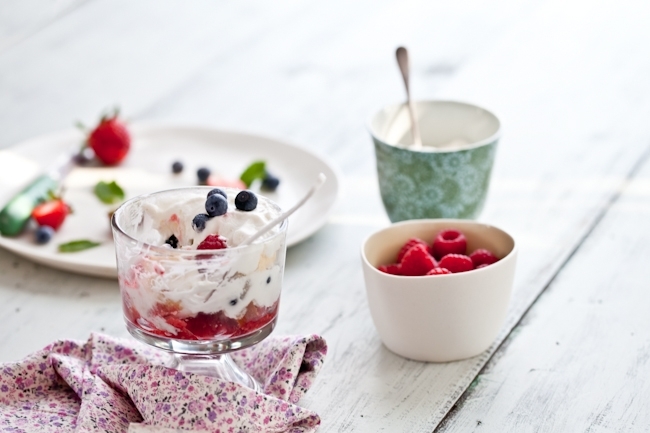 Reserve some raspberries and blueberries for decoration purposes and mash the rest with one tablespoon of honey in a small non reactive bowl. Divide the mixture among 4 glasses. 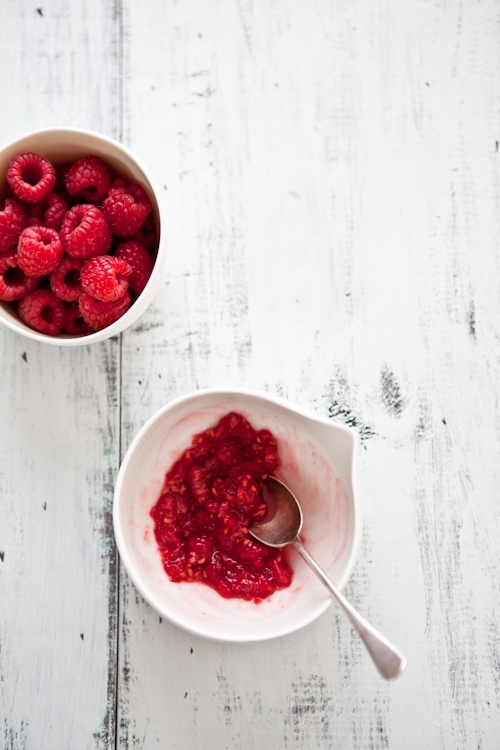 Cut 2 or 3 slices of cake in small 1/2-inch cubes and layer some pieces over the raspberry puree. Add a layer of whipped cream. Add a layer of blueberries. Add a layer of cake and a final layer of whipped cream. Refrigerate until ready to serve. 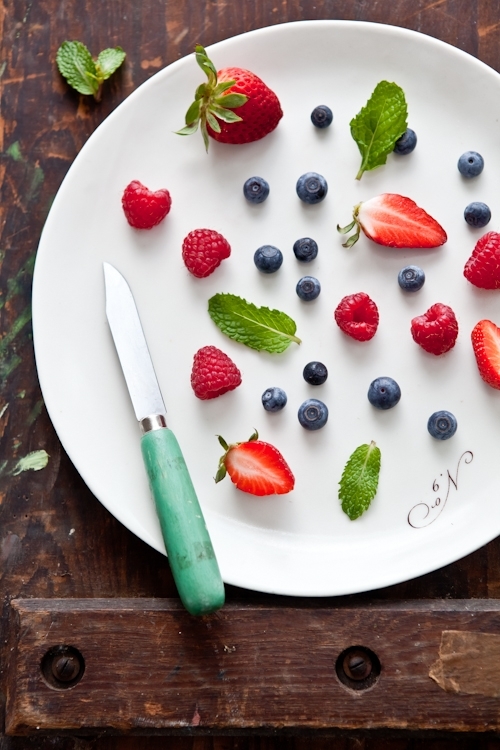 Decorate with fresh berries if desired. 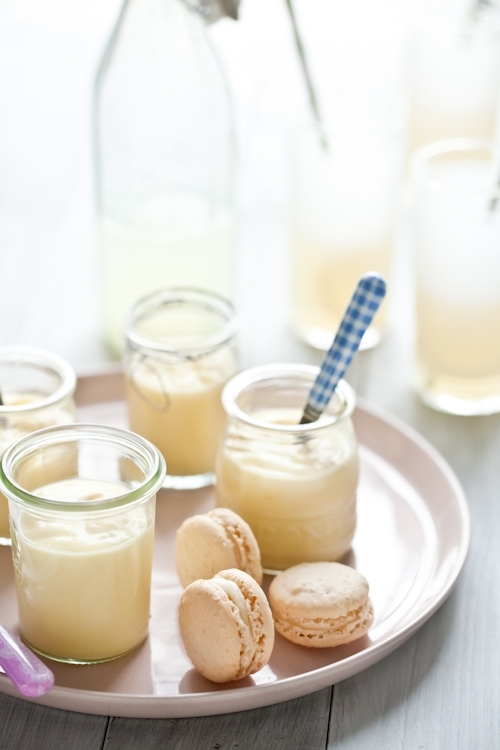 Meyer Lemon Creams, Meyer Lemon Macarons & a Giveaway! I got to say, from my view point right this minute that I am a very relaxed and lucky gal. It's been months since I have had the ability to take a day and just chill. I happen to be sharing that feeling with a dozen other bloggers too. See, this weekend a few of us are attending the first Go Savor Culinary Retreat and we are all spending some quality time getting to know each other, share our blogging experiences and enjoy the beautiful Southern sun. I was very fortunate to teach a workshop with Bill on artificial lighting last night, giving more options for folks who can only shoot at night. It was a very casual discussions and sharing of experiences, all facilitated by a good dinner and a few glasses of wine. This morning Tami and I taught a workshop on composition, food styling, choice of focal points, natural light sources, shooting tethered, etc... I absolutely *love* working with Tami. We don't even have to wonder or ask questions. It's very organic, calm, focused and efficient. We loved this session just from the sheer number of "ah doh" moment that many had. That was our goal: to provide sensible informations, techniques and tips that every one would be able to duplicate at home. It's really quite an honor to be able to share something we love with others. If it works, great. If someone decides to do something else, great! The worst thing you can do is not even consider the possibility. Photography is a series of unplanned moments, possibilities you create as well as a series of coherent decisions. It feels good to be able to share a passion with others just as passionate and interested. Same goes with baking and cooking. It is truly an honor to be sharing new recipes and ideas with you. Today it's a recipe for Meyer Lemon Cream and Meyer Lemon Macarons as well as the chance to win a super fun little new cookbook "Macarons: Authentic French Cookie Recipes from the Macaron Cafe" by Cecile Cannone. Yes, it's giveaway time! 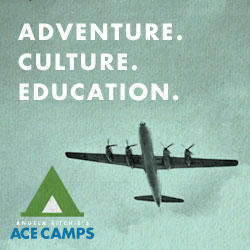 All you have to do is leave a comment on this blog, one per person, no anonymous, until Monday March 14th at midnight. A winner will be picked at random by my lovely husband and announced on the following blog post. I really enjoyed the pocket size appearance of the book as well as all the recipes, techniques and troubleshooting suggestions Cecile offers for both Italian and French Meringue Macarons. I found lots of familiar ideas such as painted macarons and lollipop macarons but also a lot of new and interesting flavors such as gingerbread buttercream and apple cinnamon buttercream. I followed Cecile's instructions for French meringue macarons and flavored the shells with Meyer lemon zest and filled them with my own filling of cream cheese flavored with more lemon and a touch of honey. 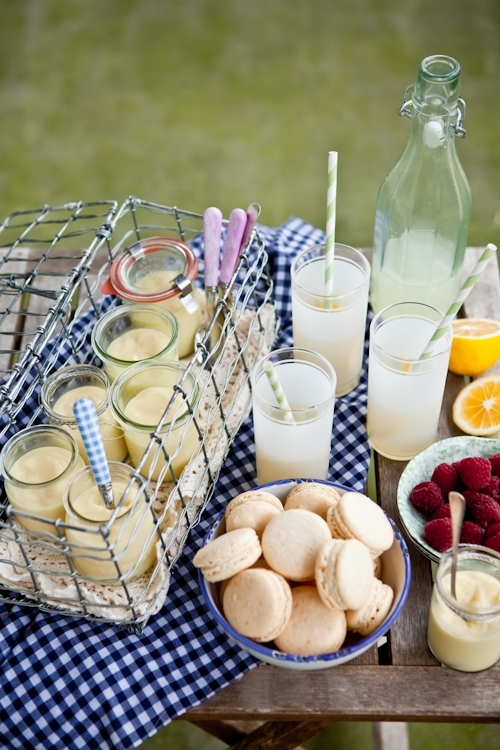 The Meyer Lemon creams are so simple and refreshing, you'd wish you had them at every meal. Almost. Variety is key I know, but for a lemon lover like me, this lemon all around dessert tray was heaven! Why so much lemony goodness you might ask. I have to thank my friends Anita and Jeanne for sending me a bunch of fresh, California Meyer and pink lemons to feed my addiction. Note: once the macarons are made, let them mature in the fridge at least 2 days prior to eating so the flavor and textures can meld together better. 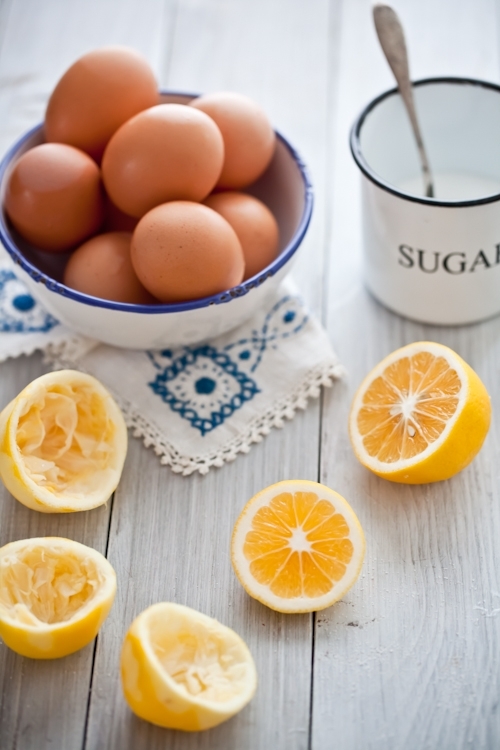 In a large bowl, whisk together the sugar, cornstarch, lemon zest and egg yolks until pale. Slowly add the milk and whisk well. Bring the mixture to boiling point in a heavy bottomed saucepan placed over high heat. Reduce the heat and simmer until thick. 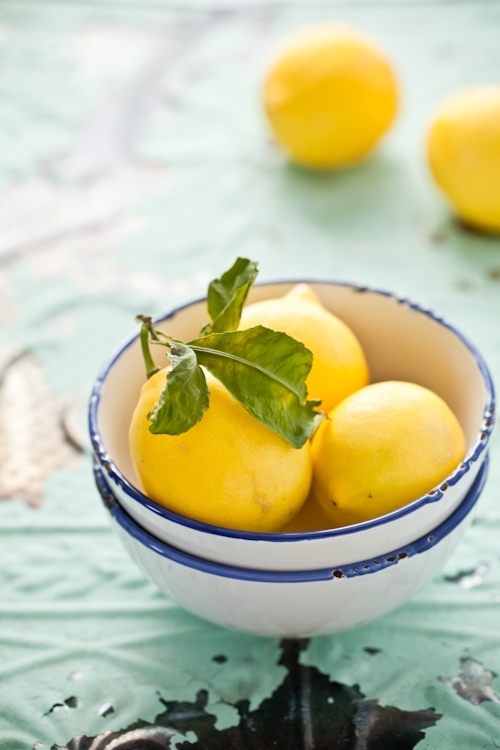 Remove from the heat and slowly add the lemon juice. Return to medium low heat for a couple of minutes. Remove from the heat and let cool. Divide among ramekins or cup and place a piece of plastic wrap over each portions to prevent a skin from forming. French Meringue Macarons, with permission of Ulysses Press. Makes 50 to 60 shells, for 25 to 30 filled macarons. Step 1: Preheat the oven to 300°F (325°F for a non-convection oven), and line your baking sheets with parchment paper. Step 2: Blend the almond flour with the powdered sugar in your food processor to make a fine powder (or sift together, discarding any large crumbs and adding a bit more almond flour and powdered sugar as needed to compensate). Then sift the mixture through a strainer until it is as fine as you can get it. This keeps crumbs from forming on the macaron tops as they bake. Step 3: With the wire whip attachment on the electric mixer, beat the egg whites with the salt and the powdered egg whites (if you are using them), starting slowly and then increasing speed as the whites start to rise. Add the granulated sugar and the food coloring. Beat until the egg whites form stiff peaks and your meringue is firm and shiny. Step 4: Pour the beaten egg whites onto your almond flour mixture and gently fold them in, using a rubber spatula. Move your spatula from the bottom of the bowl to the edges with one hand, using your other hand to rotate the bowl. Now slap the sides of the bowl until the batter falls in a wide ribbon when you raise your spatula. When you can’t see any crumbs of almond flour and the mixture is shiny and flowing, you are ready to start piping. 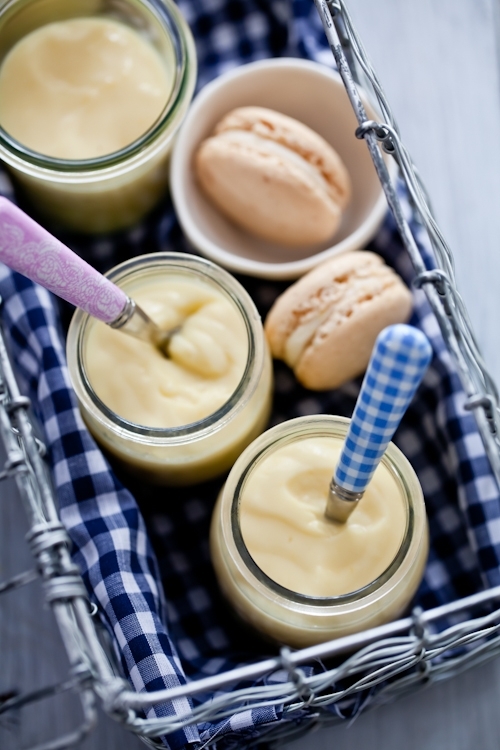 The French have a special word—macaronner—to describe the physical action of mixing all the ingredients for macarons. This has to be done by hand. You cannot do it with your mixer—you must be able to feel the consistency of the macaron batter. Step 5: Fit your pastry bag with a number 8 tip and fill with batter. Start by squeezing out a small amount of mix onto a parchment-lined baking sheet to form a 2½-inch circle. Be sure to leave 1 inch of space between macarons so they will not touch each other while they bake. If the peak that forms on the top of the macaron does not disappear after piping, it means the batter could have been beaten a little more. Tap the baking sheet on the tabletop, making sure to hold the parchment paper in place with your thumbs. Let the piped macarons rest for 15 minutes. Step 6: Bake for 14 minutes at 300°F. After the first 5 minutes, open the oven door briefly to let the steam out. Let the macarons cool completely on a rack before taking them off the parchment paper. Press the bottom of a cooled baked macaron shell with your finger; it should be soft. If the bottom of the shell is hard, reduce the baking time for the rest of your macarons from 14 minutes to 13 minutes. Using a pastry bag requires some practice. It may seem awkward at first, but you’ll soon get the hang of it. Prepare the bag (if it hasn’t been used before) by cutting about 2 inches off the narrow end—just enough so that when you insert a number 8 decorating tip, about a third of the tip extends outside the bag. Push the tip firmly in place and spoon in your filling, leaving enough room at the top to twist the bag shut. It is best to fill the bag with half of the batter at a time, that way it is not too heavy. To make it easier to fill your pastry bag, place it upright in an empty jar or other straight-sided container. This will help steady the bag while you fill it with batter. Squeezing the bag slowly, pipe each macaron shell out in a single dollop. Lift the bag quickly to finish. In bowl of electric mixer, beat the lemon zest, juice and cream cheese on low speed, until very smooth with no lumps. Add the sifted powdered sugar and beat, on low speed, until fully incorporated and smooth. Pipe or spoon about a tablespoon into the center of each macaron shell and top with another shell. 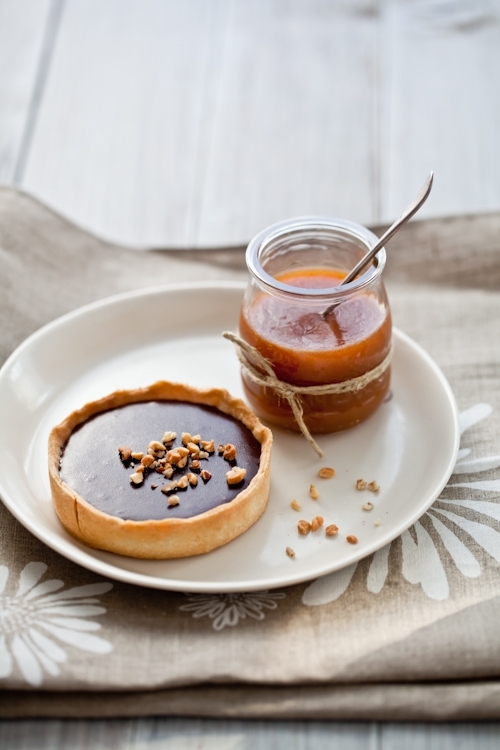 I smiled when I made these tarts. The enticing smell wrapping up the entire house. I smiled when I photographed them. The anticipation of tasting one slowly building up. I smiled when we finally shared one. My toes curling up with happiness. All we needed that day was a bit of dark chocolate and milk jam nestled in macadamia goodness. That day was Valentine's day folks. Talk about posting behind schedule! The past three weeks have been a complete blur of editing and reviewing the manuscript for Foodography. Now is ultimate crunch time before going to print in a couple of weeks. I confess I got butterflies in my stomach when the first chapters came out from the designer all laid out and ready for us to comb through, dot our i's and cross our t's one more time. Since this past November that I started writing, B. has been nothing but even more amazing than he already is. We're not into anything V-Day related but this time I wanted to do something extra special for him. He's been my rock throughout this whole project. He held me, both literally and figuratively, whether the words were coming in floods or whether I pondered over the same sentence for 30 minutes. So I wanted to make something special. I remembered a decadent macadamia tart in an issue Elle a Table that I had brought back after my last trip home. I smiled realizing I had no problem finding a magazine but it's been weeks since I have been able to match a couple pairs of socks. Obvious discombobulated sense or priorities on my part, ehehe! 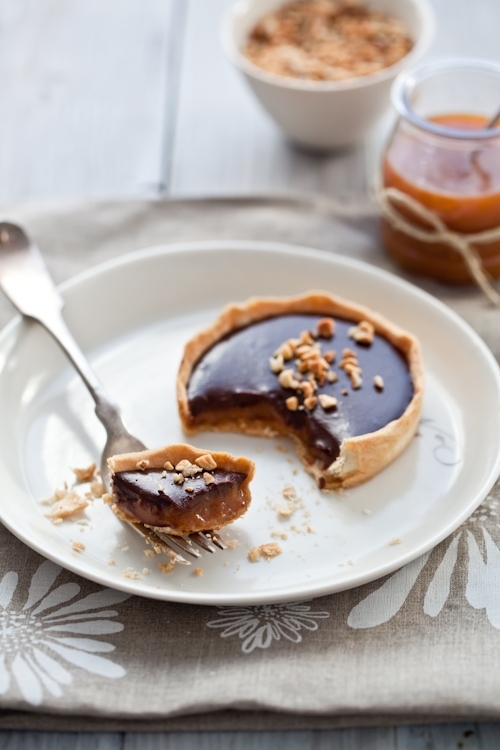 The base of the tarts is a lovely crust with ground macadamia nuts in it that gets filled with a sweet layer of milk jam and topped with a smooth layer of bittersweet chocolate ganache. 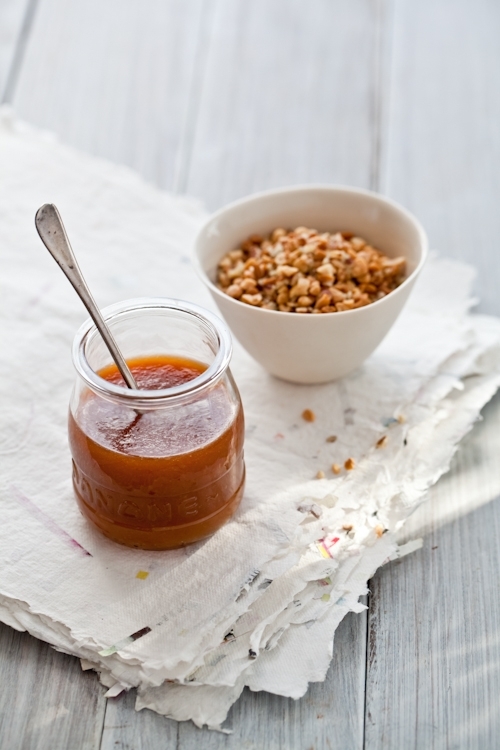 Milk jam is very similar in taste to a slow simmered cream and caramel sauce and is super easy to make. It's simply whole milk, sugar and a pinch of baking soda simmered on the stove until they are reduces to a thick caramel sauce. In a mixer, whip the butter on medium speed until light and airy. Add the egg yolks, one at a time and beating well after each addition. Mix until incorporated. Add the salt, and all the rice and millet flours, the ground nuts and mix briefly. Add some water or milk, one tablespoon at a time if the dough feels too dry. Dump the whole mixture onto a lightly floured (use more rice flour) board and gather the dough into a smooth ball. Flatten the dough into a disk, wrap it in plastic wrap and refrigerate for an hour. Preheat oven to 350F and position a rack in the center. When the dough is nice and cold, roll it out on a lightly floured board or in between two sheets of plastic to fit your prefered pie pan or six 4-inch tart rings. If the dough tears while you roll or/and transfer into the pan, just patch it with your fingertips. Line the dough with a piece of parchment paper, fill with pie weights or dy beans and par bake for 15 minutes until golden brown and completely baked. Remove the weights and parchment paper. At this point you can refrigerate the baked crust for up to 5 days before using. Let cool while you prepare the filling. Place the milk, sugar and baking soda in a heavy bottom saucepan and bring to a boil over high heat. When the mixture is boiling, turn the heat down to medium-low and simmer until thick as jam, about 45 minutes to 1 hour. The time will differ depending on the diameter of your pot, (the wider, the less time it will take) and the heat you use (electric stove set on medium low can present some differences). Place the chocolate and salt in a non reactive bowl and set aside. In a heavy bottom saucepan set over high heat, bring the cream to almost boiling (really hot basically!). When hot, pour it over the chocolate and salt. Let stand for 5 minutes before slowly whisking the mixture to bring it together to a smooth and silky ganache. If it's not completely smooth, return to very low heat for a few seconds to melt the chocolate some more. Brands vary so this step may be necessary if the chocolate is not completely melted. 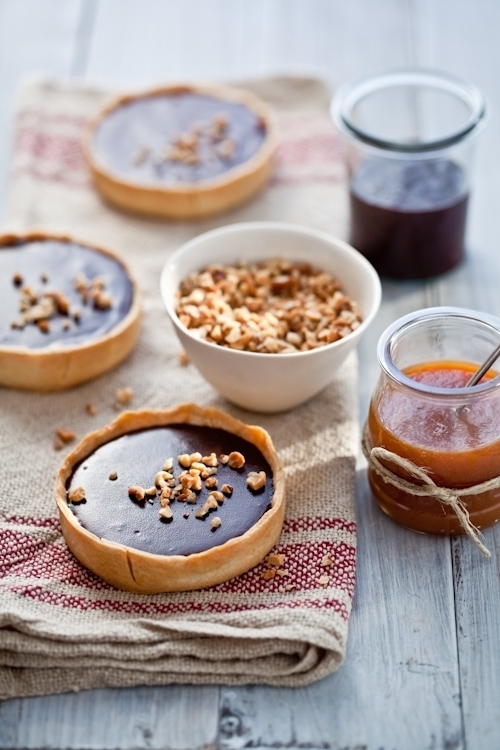 Pour 2 tablespoons of milk jam at the bottom of each tartlet. Refrigerate for about 30 minutes. Spoon some chocolate ganache over the milk jam until you reach close to the top. Refrigerate a couple of hours before serving to let the ganache and milk jam set. 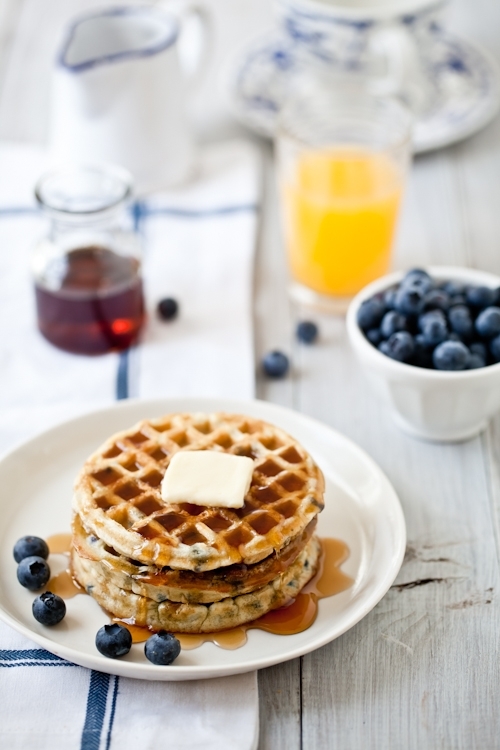 Gluten Free Blueberry Waffles & Getting Back On The Road! Sunday mornings are good for waffles and eggs. Any mornings really. But yesterday was so absolutely gorgeous that we had all the windows open, shorts and t-shirts on. I knew I had a mile long work to do but I just needed to put all this aside and do something familiar. Cracking an egg. Popping a few blueberries in my mouth. Making waffles. Hearing the whisk against the mixing bowl. Smelling the scent of freshly squeezed oranges. Doing things that require time and attention, away from the work list. It's not procrastinating but recharging my internal batteries. We sat down on the back deck with our waffles and our hot coffee and talked. I listened actually. Writing feels like talking at times. And right then, I was out of words. We made a pact to have more Sunday mornings as cozy as this one. We usually don't need a reminder to take a break but just thinking about our schedule from now throughout the Summer made me appreciate some chilling time even more. Yep. Looks like I am back on the road teaching workshops here and there. And talk about awesome workshops...All are located in gorgeous venues allowing one's creative juices to really get going! In a couple of weeks I'll be heading down to Savannah, Georgia to be part of the firstGo Savor Culinary Retreats. Since it's so close to home, it's the perfect opportunity to relax, share, be with good friends and meet new faces. We are also looking forward to the time away. We decided to team up and do a workshop on artificial light during the Go Savor retreat, targeted to the bloggers who can only shoot at night or when the quantity of light outside is not enough. B. used to operate his own portrait and wedding studio for over 10 years (in a life way before us) so it came as natural as buttering my toast to ask him to team up. He'll be doing an hands on demo on speedlights and I'll be doing one on a studio light kit. Since natural light is definitely more my grove, there will be another workshop that weekend. One of my favorite peeps, Tami from Running With Tweezers is also coming to Go Savor and we will be doing natural light, composition and styling the next day. We aim to please and we aim to share as much as people want to take in or leave out. We've attended events together, we've worked together but we've never done workshop together and I am very much looking forward to it. Check out the Go Savor site for updates on registration and great giveways. 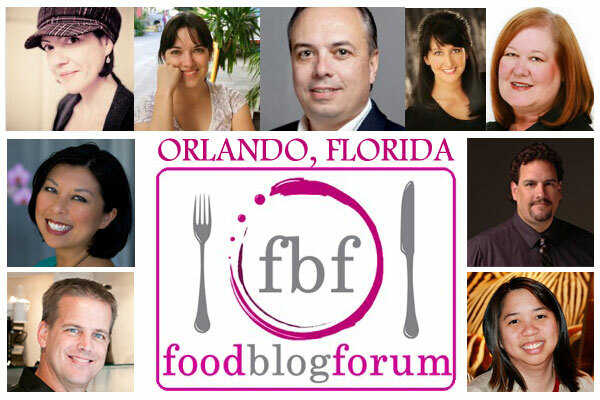 In April I'll be doing a food photography workshop as part of Food Blog Forum Orlando, April 9th. I don't have my full schedule set out for April yet, but when Jaden emailed and asked if I wanted to be part of this awesome one day event dedicated to sharing information in a fun and relaxed atmosphere. Just good peeps passing on what they know and are passionate about. The Little Kitchen persuaded her to make it happen and I am really thrilled to be able to participate and give back. For more info on the line up and registration, follow the (hot) link here. See you there I hope! When Angela Ritchie emailed last year asking me if I wanted to be one of the workshop instructors, I think I read the email 5 times before answering "yes please!". I was already familiar with Angela's workshops and how interactive, creative and completely hands on they were. Think of them as a complete retreats. I had promised myself I would do one in 2011, I had no idea I would be teaching one! I picked Sante Fe as the location because of all its earthy and colorful gorgeousness. I can't wait! If you want to get more info about this amazing opportunity to spend a complete weekend learning food photography, head over to the site here. I can't wait to be there and share, practice, show and discover new things from hanging out with different people for a few days. An now on to the recipe and some darn good Blueberry Waffles...! Mix the ground flax seed with the warm water in a large bowl, and let the mixture sit for 5 minutes. Whisk together the potato flour, rice flour, baking powder, baking soda, and salt in a medium bowl. Reserve. Blend the coconut milk with the honey and then add to the flax seeds mixture. Grease both sides of the waffle iron with a little vegetable oil or butter and pour some of the batter (1/3 cup) into the center of the iron. Close the top and cook until brown or according to the manufacturer's directions. Serve with syrup if desired.